> McAfee > Next Gen Firewall Lab Results. 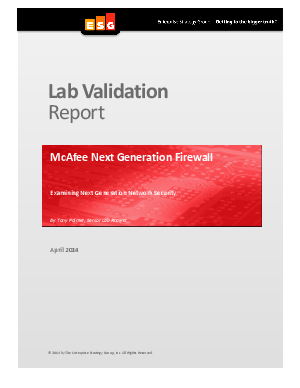 See how ESG rated McAfee NGFW in a real-world environment test lab. ESG Lab's expert third-party perspective is based on our own hands-on testing as well as on interviews with customers who use these products in production environments. Products in the firewall space have different strengths, weaknesses, and capabilities for various types of security needs. ESG Lab believes that the McAfee Next Generation Firewall offers the features, capabilities, and integration with the McAfee suite of security products that may satisfy organizations’ requirements for intelligent, actionable network security with the additional capabilities to address new and advanced evasion techniques. Any IT organization looking at next generation firewalls to improve their network security posture should give McAfee Next Generation Firewall a closer look.